I like to add giant scallops and large shrimp to my fettucine alfredo. Calamari rings are also a popular addition to this dish. While the pasta is boiling, heat a heavy bottomed skillet over medium high heat. Add vegetable or olive oil. When the oil is hot, toss in the calamari slices. Cook, stirring frequently, until the calamari has turned white, has shrunk a bit, and is just cooked through. Reduce the heat if necessary, because you do not want the calamari to brown. If the pan is too hot, you can add a few tablespoons of water to the pan. This will help to steam cook the calamari. Once done, remove from the pan and set aside. Add more oil to the pan as necessary. Once the oil is hot, cook the peeled and deveined shrimp. As soon as the shrimp turns pink on both sides, remove them from the pan. I would serve at least 4 large shrimp per person. Then, starting with a clean and dry skillet, cook the scallops. I like to use high end non-stick skillets for cooking scallops. Start with a hot skillet with hot oil over medium high heat. The scallops should only be flipped once and they should be nicely browned on the top and bottom sides while slightly raw in the very middle. This should take up to 2 minutes per side, depending on how large your scallops are. For this dish, the bigger the scallops the better. You can serve 1 giant scallop per person. Remove the scallops from the pan when done and set aside. Once the cream sauce has been tossed with the pasta, toss in the calamari and shrimp as well. 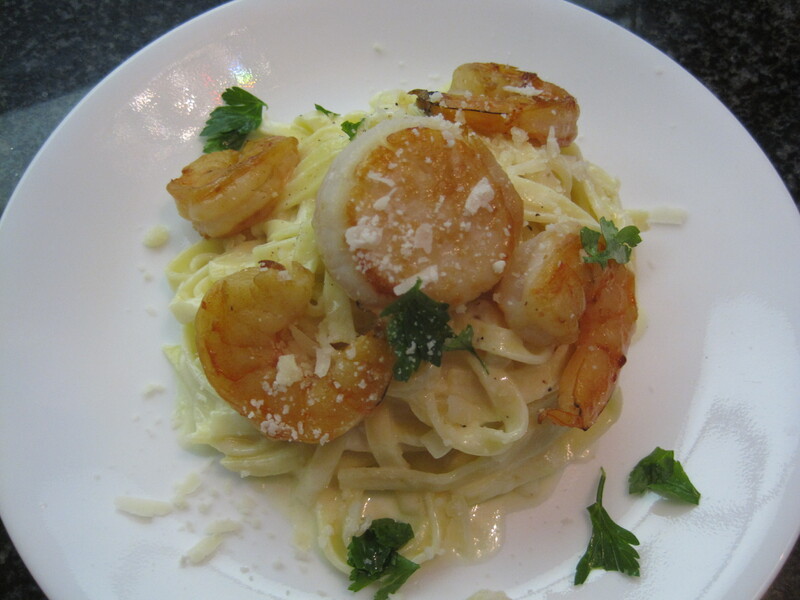 Dish out the pasta and then place one scallop on top of each person’s pasta serving. Garnish with freshly cracked black pepper and fresh parsley if desired. Serve immediately. Note: Although this pasta is delicious served plain as a main or a side dish, I like to add pan-seared scallops, shrimp, and calamari. Grilled or roasted chicken breast works well too. Also note that the original recipe includes instructions on how to assemble this dish table side. My recipe below only provides instructions for how to serve plated dishes. Scatter 3/4 of the grated cheese evenly over the bottom of a very large, heatproof serving bowl and set aside. In a large, heavy bottomed sauce pot, melt the butter over medium heat. Toss in the whole garlic loves and pour in the cream. Add a small pinch of ground nutmeg if desired. Meanwhile, bring a large pot of water to a rolling boil over high heat. Add a generous pinch of salt and add the pasta. Cover with a lid and allow the water to return to a rolling boil. Then remove the pot lid and reduce the heat slightly to maintain a strong boil. Stir occasionally to ensure that the pasta does not stick to the bottom of the pot. Cook until al dente or desired texture has been achieved. Personally, I like my pasta to be softer than al dente and still chewy. Follow the cook time guidelines on the packaging of your pasta. Once the pasta is done cooking, reserve at least 2 cups of the boiling water and set aside. Drain the pasta in a large, heatproof colander. Allow the cream to come to a near or very gentle simmer, stirring frequently. Reduce the heat if necessary to prevent the cream from boiling. 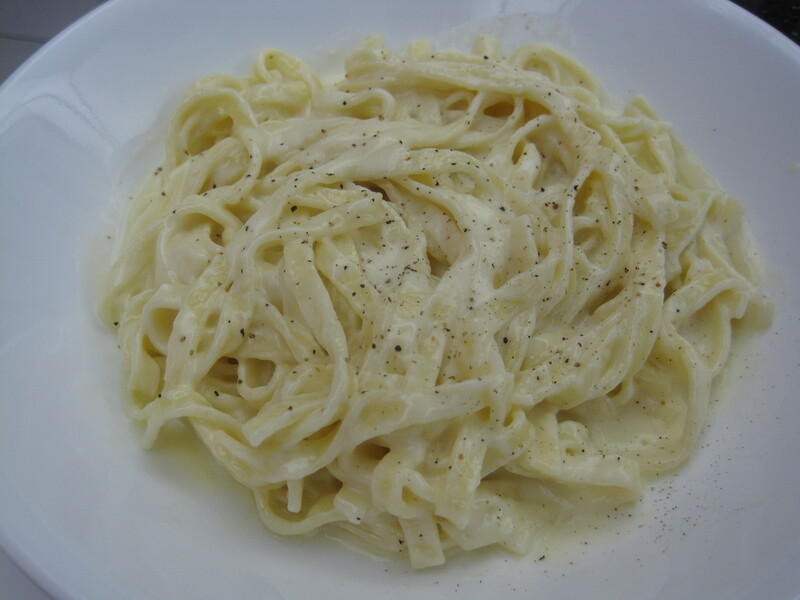 Allow the cream to reduce slightly and become infused with the garlic flavour until the pasta is ready. From the time that the pasta is ready, you must work quickly so that the pasta and sauce do not have a chance to cool, because this dish is best enjoyed when freshly made and piping hot. Remove the garlic cloves and pour 3/4 of the sauce all over the grated cheese in the serving bowl. Allow this to set for a few seconds, before giving it a few stirs. Add salt to taste if necessary. Add the drained pasta to the serving bowl and toss to combine with the sauce. If you prefer a thinner consistency to the sauce, add the reserved pasta water, a few tablespoons at a time, and toss to combine. Then dish out the pasta onto individual plates for serving. Spoon some of the reserved cream sauce over the top of each pasta serving and, if using, top with cooked seafood or chicken. Then add freshly ground black pepper, sprinkle over some of the reserved grated cheese, and garnish with parsley if desired. Serve immediately, while still hot, as a starter, a side, or as the main course. Hi there, Calphalon is a common and easy to find brand that makes high quality non-stick pans. I should warn you, though, that they can be quite expensive. From what I’ve heard, Anolon is very good too. I hope that helps.